$50 coupon off water heater installation. Must mention code WH50. 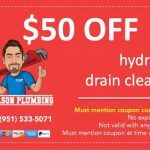 $50 coupon off hydro-jet drain cleaning. Must mention code Hydro50. 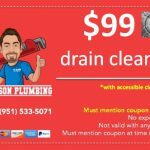 $99 drain cleaning coupon by RT Olson Plumbing. Clean-out must be accessible. Must mention code DC99.